The run diary of two girls who like to get dirty (on muddy trails, of course). A few months ago I signed up for the Portland Trail Series as a way to get more exposure to the Portland Trail / Ultra Running community. There are several groups that get together weekly for runs, but I am such an introvert that I get anxious about not knowing anyone. I figured signing up for the Race Series I didn’t have to be social if I didn’t want to since it is a race, but at the same time I would get around the community which would help ease my anxiety, so maybe I could get the courage up to join one of the “social” runs. 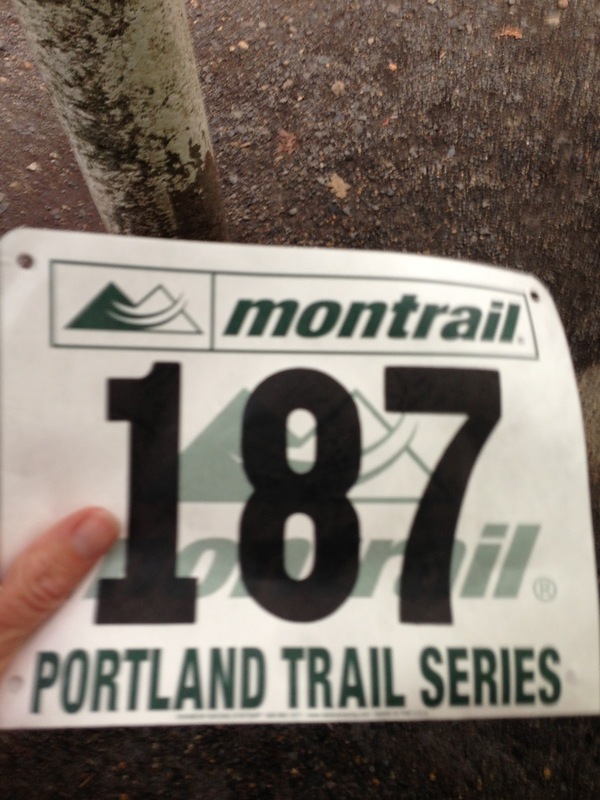 The Portland Trail Series is a super-cool, low-key series of trail races held in Forest Park in Portland. A total of five races are held every other Wednesday evening from September-October, and each race will cover a different, challenging course, ranging from 4-6 miles. Runners that participate in at least four races are included in the overall Series standings, and doing well in the Series will land you some fantastic gear from our great sponsors. The Series will benefit the Forest Park Conservancy and a post-Series party is held immediately after the final race at the Lucky Lab Brew Pub. There we will present awards to Series winners, hold a raffle and enjoy a well-deserved beer. This week’s route was pretty hilly for being only 5.78 miles. We started at the Thurman / Leif Erickson trail head. We ran up Leif to Dogwood and up Dogwood to Wildwood. Yassine and his daughter were at the Dogwood cheering on all the runners and directing traffic. It was great to see him, he gave me a big high five. We continued climbing a bit on Wildwood to Alder, then we got a nice downhill on Alder to Leif Erickson. We then went back up Dogwood all the way to NW 53rd and then back down on Wild Cherry to Leif to the end. I killed it on the hills and passed a lot of people, but then all the same people passed me on the down hills. Once I hit Wild Cherry and knew it was down hill all the way I imagined I was chasing Susan down hill which sped me up a bit. I was 9th in my age group and 16th female. You didn't tell me you saw Yassine! Our family hiking trip this year was to the Dolomites, more specifically Alta Via 1. John and I have done several hut to hut hiking trips in the Alps and planned them all ourselves, we never had any problems. As I started to plan our trip to the Dolomites, it became clear to me that it might be easier if we used a local company to help us book our accommodations and transportation. That way when questions came up from family members there was someone we could ask. 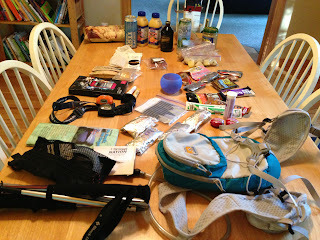 Also letting the ultrarunner of the group plan the daily hiking itinerary probably isn't the best idea. I ended up contacting Dolomite Mountains, I sent them my itinerary, the places I had already booked and a few other specifications and Monica created an agenda pretty similar to the one I already had in mind. As much as I like to plan things myself, it was nice to have someone local and not feel responsible for 5 other people's vacation. Plus if they thought the hike was too hard they couldn't blame me. My husband John, Cedar and I recently spent a week in Boulder working, running, and snowboarding/skiing. We decided to drive our Sprinter from Portland to Boulder to see what all the hype was about. Since we were working while we were in Boulder we had to limit our exploring time to before and after work and the weekends on the drive to and from Boulder. So our days were broken down into 3 areas: working, activities and eating & drinking. The company I work for has an office in Boulder with free food. John and I would work from the Airbnb in the morning and head over to the office around lunch for free food and to work the rest of the afternoon. We did find a place called The Rayback Collective that had a great indoor area for co-working, it also had an amazing beer garden with several food carts. We especially liked the Indian food cart, I wished I remembered the name, they had so many tasty bite size items for $1-$2. I took the whole week off for spring break, which I spent in Austin, TX, with my family. But just before we left I realized that we'd be back Thursday evening, which left Friday free for a long run! Ann checked on the Wilson River Trail, which we tried (and failed) to run last month due to the amount of snow blocking the trailhead and covering the hilly trail itself. All clear! 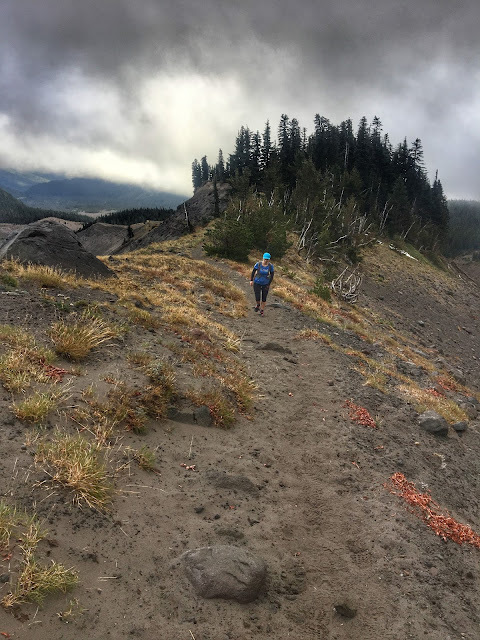 The Peterson Ridge Rumble is a classic laid back community trail race that takes place in Sisters, Oregon. Almost every trail runner we know has run it at least once, most people at least few times. The trails are at a low enough elevation that snow normally isn't an issue and you get amazing views of the central Cascades. It's a race that people hangout for hours after they cross the finish line cheering people on and catching up with friends. It is a great way to kick of the season. Susan and I have ran the Peterson Ridge Rumble 40 mile race twice, but now that we a four legged trail runner as part of our pack we decided to include him. The 40 mile race does not allow dogs but the 20 mile does. I was so excited when I signed Cedar up for the race, I was equally as excited to run the shorter distance. 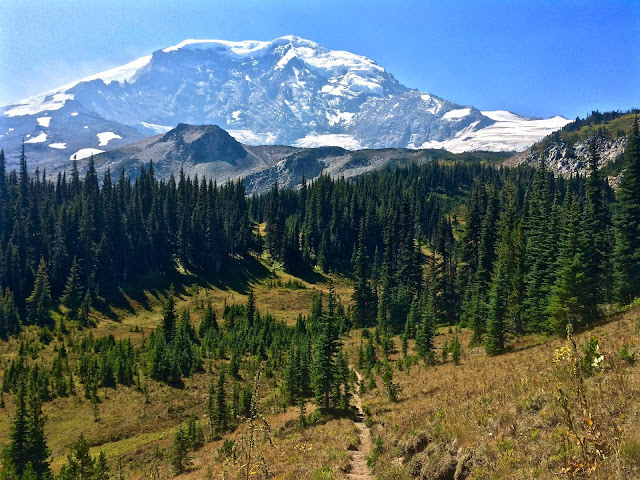 Ann's story (the planning) Ever since I did my first multi-day backpacking trip 10 years ago, I have wanted to circumnavigate Mt. Hood. We actually planned a backpacking trip to do in 2007, but after doing some research realized part of the trail had been washed out and was closed. So the Mt. Hood circumnavigation was put on the back burner until I started running long distances. I mentioned to Susan last summer that we should do it, but it wasn’t until early this year when we were trying to find a race during the summer that was 40 – 50 miles and fit both of our schedules that I mentioned we should just do Mt. Hood. It worked out great, since we could do it during the week when there is less traffic on the trail and we wouldn’t have to give up a weekend day with our families.